In her first national interview of the 2016 presidential campaign, Hillary Clinton falsely claimed that “all” Republican presidential candidates “don’t want to provide a path to citizenship,” and she distorted the facts on her exclusive use of private email as secretary of state. Two GOP candidates — Sens. Lindsey Graham and Marco Rubio — voted to overhaul the immigration system, including to provide a path to citizenship. Both have recently reiterated their support for eventually allowing people now living here illegally to become U.S. citizens. Clinton said she went “above and beyond” in complying with a State Department request to turn over work-related emails, saying, “I didn’t have to turn over anything.” However, federal regulations and department guidelines required her to preserve important work emails before she left office, and she did not. Twice Clinton said that previous “secretaries of state” did the “same thing,” using the plural “secretaries” to defend her use of her personal email account. But the State Department has said only Colin Powell used a personal email account for official business. Twice Clinton said that she had “one device” for sending emails, explaining she is “not the most technically capable person and wanted to make it as easy as possible.” But, in addition to her Blackberry, she occasionally used an iPad to send emails, copies of her publicly released emails show. Clinton was interviewed by CNN’s Brianna Keilar on July 7. She discussed a range of topics, including illegal immigration and the controversy surrounding her use of private emails while serving in President Obama’s cabinet. When asked about Donald Trump’s remarks about Mexicans, Clinton said the Republican presidential candidates “are all in the — you know, in the same general area on immigration. They don’t want to provide a path to citizenship.” That’s not accurate. At least two declared Republican candidates — Sens. Lindsey Graham and Marco Rubio, both of whom voted for the 2013 Senate immigration bill that included a path to citizenship — have said that they favor providing citizenship for the millions of immigrants currently living in the U.S. illegally. In May, Graham told USA Today that he “absolutely” favors a path to citizenship. Susan Page, May 7: Let’s talk about immigration, because, on this topic, I think you are different from every other Republican presidential contender. You are the only one who advocates a path to citizenship. Graham: Absolutely. As a matter of fact, if I were president of the United States, I would veto any bill that did not have a pathway to citizenship. And let me tell you why. We’re going to make sure that they go through a criminal background check and criminals and felons and people who have been up to no good, they can’t stay. But as to the rest, they have to learn the English language as a requirement to stay. They have to pay a fine because they did break the law. They have to get in the back of the line in terms of people who have been waiting patiently to become citizens. When they do all that, they’ll have a 10-year bar before they can apply for a green card. The one thing I will not tolerate is allowing millions of people to live here the rest of their lives without an opportunity to become part of us. So you will have a long, hard path to citizenship. Whether you become a citizen will be up to you and how you perform. But we’re going to create that path because I don’t like the idea of millions of people living in America for the rest of their lives being the hired help. That’s not who we are. Graham campaign website, July 8: Illegal immigrants should be forced to live under our rules, not theirs. It is essential that we pursue reforms that will bring an end to the unsustainable problem of 11 million illegal immigrants currently in our country living outside the bounds of legal structures. The status quo is de-facto amnesty. All illegal immigrants must be required to make restitution by paying steep fines, registering with the government, paying taxes on income, learning English, and getting in line behind every single legal immigrant if they want to apply for citizenship. Schieffer, April 19: Well, if you became president, would you sign the bill that you put together into law? Rubio: Well, that’s a hypothetical that will never happen. What I would do if I was president, the first thing I would do is, I would ask Congress to pass a very specific bill that puts in place E-Verify, an entry-exit tracking to prevent visa overstays, and improve security on the border. Once we achieve that, step two would be, we would modernize our legal immigration system, less family-based, more merit-based. And then the third step would be to pass the bill that goes to the 10 million people that are here, or 12 million that are here illegally. If they have been for longer than a decade, they have to pass background check, they have to learn English, they have to pay taxes, they have to pay a fine. And they would get a work permit. And after a substantial period of time in that status, assuming they haven’t violated any of the conditions of that status, they would be allowed to apply for legal residency, just like anybody else would, not a special process. And after you’re a legal resident, after a number of years, by law, you’re allowed to apply for citizenship. It’s a long process. It’s a reasonable process. It’s a fair process. But it has to happen in that order. And it begins with serious enforcement measures. Rubio went on to explain that he would only do so if the U.S. takes the same steps, such as securing the border and creating an electronic verification system, that he previously outlined. Clinton, who was secretary of state from January 2009 to February 2013, also discussed her exclusive use of a personal email account when sending and receiving emails about official government business. Her unusual email arrangement, which included the use of a private email server, became public in March — several months after the State Department in October 2014 sent letters to the last four secretaries of state requesting any work-related emails that they may still have in their possession. Clinton’s office has said she turned over 30,490 printed copies of emails totaling about 55,000 pages — estimating that more than 90 percent of those emails went to federal employees on the government email system. It also said that 31,830 “private, personal records” were destroyed. Clinton, July 7: Now, I didn’t have to turn over anything. I chose to turn over 55,000 pages because I wanted to go above and beyond what was expected of me because I knew the vast majority of everything that was official already was in the State Department system. We asked the Clinton campaign what she meant when she said that she “didn’t have to turn over anything” to the State Department. It referred us to a previous statement released by Clinton’s office, specifically an excerpt that explained how Clinton complied with the department’s request. But that didn’t answer our question. And the fact is that Clinton should have preserved the emails before she left office. Two months later, the State Department updated its Foreign Affairs Manual to include policies for preserving emails. In 2009, NARA specifically addressed the issue of emails “created or received outside of official electronic systems maintained” by the federal government, according to Jason R. Baron, a lawyer at Drinker Biddle and a former director of litigation at the National Archives. The NARA regulations also require federal departments and agencies to maintain an NARA-approved schedule for the disposition of federal records, including emails sent and received from personal email accounts. In an email to us, Baron wrote that Clinton had a “duty” to turn over her emails, even after she left office. “For example, at the State Department, the so-called ‘SMART’ system apparently has been used in a fashion (at least until recently) where only a tiny percentage of e-mail communications were tagged as records in an electronic archive repository,” Baron wrote. The State Department has said that Secretary John Kerry’s emails are now automatically preserved, but that was not the case under Clinton. State Department spokeswoman Jen Psaki has said that the department sent letters to previous secretaries Madeleine Albright, Colin Powell and Condoleezza Rice. Only Powell used personal email for official business. Psaki, March 10: Well, let me give you a quick update – actually, this is another update on former secretaries. Also we intend to – I think some have asked about the letter sent to secretaries. We intend to release that as well, the text of that letter, so hopefully soon. Former Secretary Rice – I’m just going to go through all of them if that’s okay – responded to the Department’s letter and informed us that she did not use personal email for official business. Early in March of this year, General Powell advised – and I think he’s spoken to this publicly as well – that he used a personal email account during his tenure as secretary of state. He did not take any hard copies of emails with him when he left office and has no record of the emails, with the account he used having been closed for a number of years. Former Secretary Albright advised that she did not use email as secretary and has no records in her possession. Although Powell did acknowledge that he used personal email for official business, there’s no evidence that he — or any other previous secretary of state — maintained emails on a personal server. As she has said in the past, Clinton suggested that she did not use a government email account because that would have required carrying around two devices. 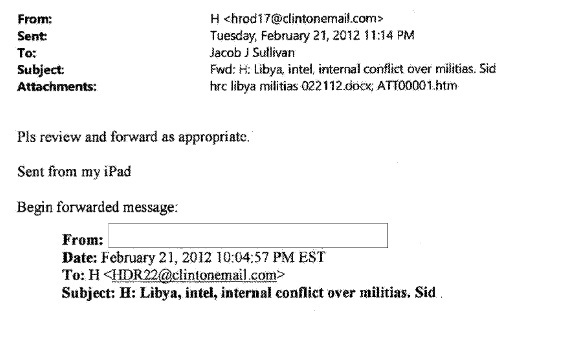 She did not have one device for sending emails. She had two — a Blackberry and an iPad — according to the Clinton emails released so far by the State Department. It has long been known that Clinton used a Blackberry, as captured in an iconic photo she used on Twitter. But the Associated Press reported in March that Clinton used an iPad to send and receive some emails. Since then, the State Department has released Clinton emails that include at least one, shown below, that Clinton sent from her iPad. In the Associated Press article, Clinton spokesman Nick Merrill said the candidate used the iPad primary to read articles, not to send emails. The Clinton campaign reiterated that point, adding that the iPad didn’t exist until 2010 — a year after Clinton had made her choice to use a personal email account to exclusively conduct business. But the fact remains that she carried around two devices capable of sending emails and she did use both for sending emails — despite what she told CNN. As Gowdy pointed out, Clinton did receive a House subpoena on March 4, and it was well reported. But Clinton’s denial came in response to a question about deleting emails “while facing a subpoena,” and Clinton objected to Keilar’s “assumption.” Clinton’s campaign said that the emails were deleted before she received the subpoena and that was the point Clinton was making. Keilar, July 7: … while facing a subpoena, deleted emails from them? Clinton: You know, you’re starting with so many assumptions that are — I’ve never had a subpoena. Merrill, July 8: She was asked about her decision to not to retain her personal emails after providing all those that were work-related, and the suggestion was made that a subpoena was pending at the time. That was not accurate. In fact, Trey Gowdy did not issue a subpoena until March, months after she she’d done that review. Further, the subpoena was specifically asking for documents pertaining to Libya and the attacks on our facility in Benghazi, documents which, along with tens of thousands of others, she had already given to the Department of State.